There was a good article Saturday in the New York Times about the natural gas industry’s struggle to be heard in Washington in regards to the energy/climate change legislation. As has been discussed here and elsewhere ad nauseum is the fact that the natgas industry was so late to the table with the current round of legislation that it missed the entrée altogether. Industry lobbyists hope to get a mulligan when the Senate takes up energy/climate change, but they are going to have to fight hard for it. 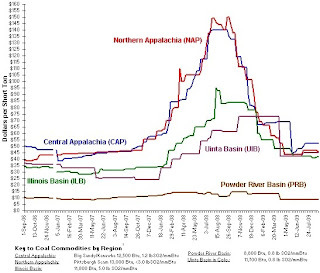 The coal industry is hyping the fiction of “clean coal” and the relative stability of coal prices. Coal prices have seen volatility lately (see chart below), but natgas is going to have a heck of a time depicting itself as being stably priced. The coal lobby is pushing the concept of carbon sequestration, but that is not a technology that is been proved viable on a large scale. It’s difficult to hear the coal folks push a fantasy when the natural gas folks can talk about abundance, ample delivery infrastructure and low pollution. Believe me, I’m very much in favor of the carbon sequestration concept, but until it is economically viable, it is a research project, not a solution. Let’s fund research on the subject. But the real story is the fact that the coal lobby is very powerful and is able to sway a huge number of senators. But our energy problems are pollution and foreign dependence, both of which are problems of today. We need solutions that can be implemented now, not years down the line. As Chesapeake Energy CEO Aubrey McClendon says in the article, “(n)ever in my life have I been confronted with something so obviously easy and good to do and have such Congressional apathy.” At least it is not a partisan issue. Both Republicans and Democrats have trouble seeing the light. I don’t see Congress or the government as the enemy. Far from. The problem is that people in power are responsive to those who are whispering in their ears or yelling at them at close range. Ultimately, one of the biggest weapons the natgas industry possesses is the fact that it is a growing domestic industry. With the new shale discoveries, it is now a growing industry in 32 different states. Once elected officials realize this, they may think twice of erecting roadblocks in front of the better fuel.